Start by removing the base of the pineapple with a sharp knife. Ensure you do not cut too far up, and keep the bottom piece if you would like to use it to set the pineapple on after it has been painted. Once the bottom of the pineapple has been removed, use your corer to remove the sweet fruit without damaging the outside. Set aside the pineapple fruit to enjoy immediately or prepare in a delicious platter (check out some great holiday recipes here!). Cut out core remaining inside pineapple shell and discard. 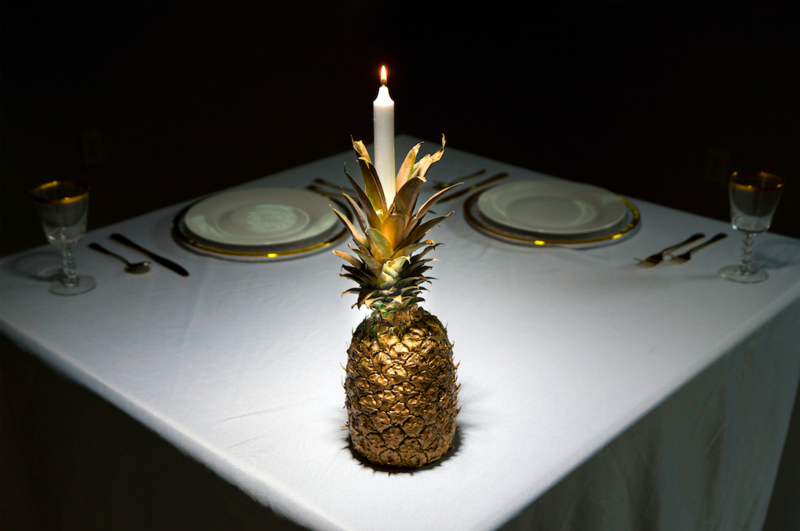 In a well ventilated area, spray paint your pineapple gold. Let dry. Once dry, use a small knife to cut a small area in the top of the pineapple crown. This will be used as a stable area for your candle to be inserted. Insert candle, and enjoy your new decor! Watch more how-to videos, recipes and ideas via our Youtube Channel here! This entry was posted in Featured, Latest News, Recipes, Tips & Tall Tales and tagged christmas, holiday table, holiday table decor, holidays, table decor, thanksgiving, wedding decorations, weddings. Bookmark the permalink.